This is the only available facsimilie of the very rare first impression of the first edition of 1861 making it quite different from other editions available in the market today. It is, for example, the only edition written entirely by Mrs. Beeton and the only edition to bear the splendid colour plates in the style of Baxter prints that graced the original book. The publishing history of Mrs. Beeton's book is in many ways a microcosm of the history of publishing during the last 150 years. Her husband Samuel, whom she married at the age of 20 in 1856, was a publisher of considerable flair and brilliance who had launched The English Woman's Domestic Magazine just four years before their marriage. This was the first magazine to be devoted entirely to the interests of women and was a great success, much of it edited by Isabella. The Beetons invited recipe contributions from readers and issued them in 24 monthly parts between 1859 and 1861, when they were bound together for the first edition. Following Isabella's death from puerperal fever in 1865, Samuel faced financial difficulties and sold the rights to Ward, Lock & Tyler. 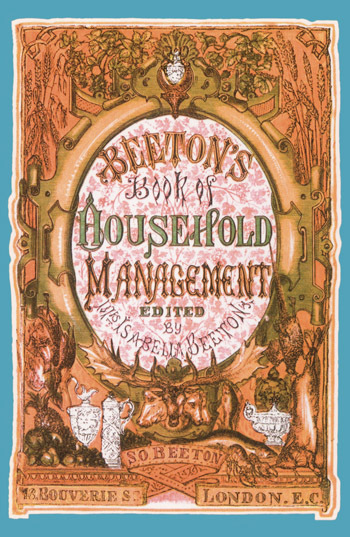 The firm recognized a golden goose when it saw one and continued Samuel's innovation of selling sections of Household Management at various prices to suit all pockets, such as Beeton's Penny Cookery Book, (1d), Mrs Beeton's Cottage Cookery Book (3d) and so forth. They also issued a second edition in 1869 which Samuel helped to edit. In 1888 came a major revision, followed by another update in 1906 and so the marketing and spin-offs continued into the twentieth century, when, in 1995 the rights to use Mrs. Beeton's name was licensed to food manufacturers by the then publishers, Cassell. What of the recipes themselves? Isabella said of her work that she sought recipes that would help people "to live economically, tastefully and well." The book is a serious and very good cookery book of mid-Victorian and early 19th century recipes, each of which was tried out in her own kitchen by herself, her cook and her kitchenmaid. Lacking the 'high Edwardianism' and French bias introduced in later revisions, this 1861 edition has particular appeal for today's readers who will appreciate the emphasis on practicality and local ingredients. Her first criterion being that they should be economical, she always included the cost at the end of each recipe as well as how many mouths each dish would feed. When she describes a dish as "rich" or "very rich", for example, she is marking the degree of economy that they represent. Like Eliza Acton before her, she listed ingredients for each dish. This edition is a classic and deserves to be on the shelves of every serious amateur and professional cook today.